Aw geez, is there any state in the U.S. that should be less creepy than Minnesota? Sharing a border with Iowa, the useless Dakotas, cheesy Wisconsin, and benevolent Canada, Minnesota exists in an area without the remoteness of Appalachia, and you never hear news stories from Minnesota the way you hear news stories from Florida. Situated in the Midwest, America's heartland, the place appears so quaint and wholesome, where would a "dark side" even be able to lurk? The answer is: everywhere. Every place harbors a dark, spooky side, as this list of Minnesota urban legends can attest. From cannibalistic monsters to spectral pick-up trucks, the variety of ghost and paranormal stories from Minnesota is as impressive as any other state; Native American folklore and modern myths permeate its wilderness. In addition to sending shivers down your spine, many of these Minnesota scary stories also propose new versions of history, including alleged evidence that Vikings may have traveled further west than previously thought. Enter the Land of 10,000 Lakes at your peril. Minnesota is home to one of the most famous UFO encounters of all time. 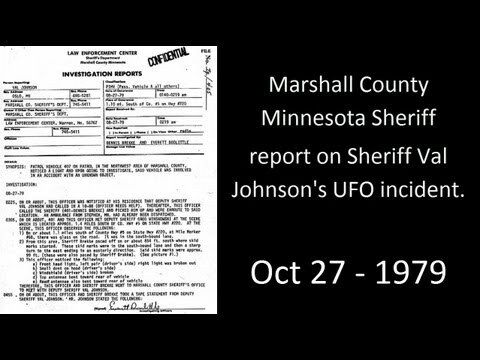 On August 26, 1979, Marshall County sheriff's deputy Val Johnson was on night patrol on a rural stretch of State Highway 20, just outside of Warren, MN, when a ball of light appeared on the road ahead of him. Johnson drove his patrol car towards the light to investigate further when suddenly the ball of light was inside the car with him. And it attacked him, hitting him "like a 200-pound pillow." The next thing Johnson knew, he woke up in a ditch a half-hour later with burns around his eyes, and both his wristwatch and dashboard clock had slowed by 14 minutes. His windshield and one of his headlights had been smashed, and both of his car antennae were sharply bent out of place. A police investigation reached no conclusions, but the incident became one of the most well-known and influential cases in all of modern UFO lore. One of the oldest monsters in Minnesota is the wendigo, a cannibalistic spirit from Native American folklore. Legend holds that humans who resort to cannibalism, either out of desperation or dark rituals, will be transformed into a fifteen-foot tall monster covered in hair, with glowing eyes, long fangs, and a snake-like tongue. These lanky creatures terrorized ancient Native American communities in Minnesota, and even some early white settlers claimed to have encountered the hungry spirits. As recently as the early 20th Century, local Native Americans believed in and hunted for the wendigo. One of the most famous wendigo hunters was Jack Fiddler, who claimed to have killed 14 of the beasts in 1907. His last victim was a Cree woman whose murder landed Jack and his son on trial for her killing. Their defense was that she was about to transform into a wendigo, and had to be killed to stop her from killing and eating others. The Kensington Runestone is one of the most controversial archeological objects ever uncovered in Minnesota. Discovered in 1898 by Swedish immigrant Olaf Ohman in the town of Solem, MN, the 202-pound stone is covered in Norse runes that appear to have been carved by at least two different people. The inscription on the stones purports to be a record left behind by Scandinavian explorers in the mid-14th century, who came exploring west from Vinland, made camp, and went fishing on a nearby lake, only to return and find their camp-mates slaughtered (presumably by local natives). Scholarly consensus holds that the stone is an elaborate hoax, but it remains a popular item of speculation for amateur crypto-historians everywhere. One of the intriguing implications of the runes is that there may have been a permanent Norse settlement somewhere to the east, in "Vinland." Or it means that travel to-and-from Vinland was common enough that Scandinavian sailors knew their way around the northeastern portion of North America 300 years after Leif Erickson, and 150 years before Columbus. Grey Cloud Island, just outside of Cottage Grove, MN, hosts the largest number of Native American burial mounds in the United States. Named after a Sioux woman who became prominent in the local fur trade, the island hosts all manner of spooky manifestations, including ghostly coyotes and the spirit of Grey Cloud herself. But perhaps the strangest haunting on the island is a ghostly white pick-up truck reported to appear and chase strangers off the island, which is considered sacred ground by Native Americans. Some witnesses claim the truck is driverless, while others say it has an equally spooky driver.